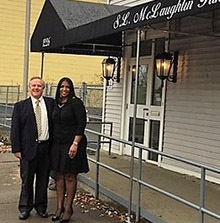 With over 25 years of experience as a licensed funeral director, Shannon McLaughlin knew that the Capital Region needed another funeral home to cater to the African-American community. She brings a strong belief that following a death, survivors need “Peace, Trust, and Comfort” to work through the grieving process. In fall 2017, Shannon was accepted into the Albany SBDC’s Small Enterprise Economic Development (SEED) program, a microloan program that provides up to $35,000 for entrepreneurs having difficulty accessing financing. It was established in 2011 through a partnership between SEFCU, the University at Albany’s School of Business, School of Social Welfare and SBDC. With a business plan and financial projections in hand, Shannon was approved for a $35,000 loan to renovate a former post office into a full-service funeral home. The S.L. McLaughlin Funeral Home opened in August 2018 to serve the residents of the Capital District area with the highest regard for professionalism, compassion, and honesty. In a short period of time, with the support of her father, Shannon met with local church pastors and congregations to promote her business. Shannon’s son Hunter has joined the business serving as a Funeral Assistant while attending a local college. Shannon says that “the SEED program was a life changer for me and my family. SEFCU and UAlbany believed in me. The knowledge and skills that I developed through the program put me in the right mindset and set me up to be a successful female entrepreneur.” The SEED microloan fund has provided over $2 million in capital to local entrepreneurs while creating or retaining 186 jobs.